PMWEB can run any of its training courses at your own venue or somewhere close to your organization. As an example, assuming that a course is held at your venue in the UK, a 4-day TOGAF course for 8 delegates can work out as little as £500-£600 per delegate. These costs will vary depending on location. We may sometimes be beaten on price but we won’t be beaten on quality. Please contact PMWEB for more information or a quotation for a TOGAF tailored training course. TOGAF®, an Open Group Standard, is a proven enterprise architecture methodology and framework used by the world’s leading organizations to improve business efficiency. It is the most prominent and reliable enterprise architecture standard, ensuring consistent standards, methods, and communication among enterprise architecture professionals. Enterprise architecture professionals fluent in TOGAF standards enjoy greater industry credibility, job effectiveness, and career opportunities. TOGAF helps practitioners avoid being locked into proprietary methods, utilize resources more efficiently and effectively, and realize a greater return on investment. First developed in 1995, TOGAF was based on the US Department of Defense Technical Architecture Framework for Information Management (TAFIM). From this sound foundation, The Open Group Architecture Forum has developed successive versions of TOGAF at regular intervals and published them on The Open Group public web site. 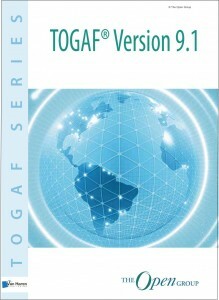 TOGAF Version 9.1 is a maintenance update to TOGAF 9, addressing comments raised since the introduction of TOGAF 9 in 2009. It retains the major features and structure of TOGAF 9, thereby preserving existing investment in TOGAF, and adds further detail and clarification to what is already proven. PART I (Introduction): This part provides a high-level introduction to the key concepts of enterprise architecture and in particular the TOGAF approach. It contains the definitions of terms used throughout TOGAF and release notes detailing the changes between this version and the previous version of TOGAF. PART II (Architecture Development Method): This is the core of TOGAF. It describes the TOGAF Architecture Development Method (ADM) – a step-by-step approach to developing an enterprise architecture. PART III (ADM Guidelines & Techniques): This part contains a collection of guidelines and techniques available for use in applying TOGAF and the TOGAF ADM.
PART IV (Architecture Content Framework): This part describes the TOGAF content framework, including a structured metamodel for architectural artifacts, the use of re-usable architecture building blocks, and an overview of typical architecture deliverables. PART V (Enterprise Continuum & Tools): This part discusses appropriate taxonomies and tools to categorize and store the outputs of architecture activity within an enterprise. PART VI (TOGAF Reference Models): This part provides a selection of architectural reference models, which includes the TOGAF Foundation Architecture, and the Integrated Information Infrastructure Reference Model (III-RM). PART VII (Architecture Capability Framework): This part discusses the organization, processes, skills, roles, and responsibilities required to establish and operate an architecture function within an enterprise. Our TOGAF 9.1 Examination Preparation course covers both the Foundation and Certified Levels (Level 1 and Level 2). The course duration is either 4 days or 5 days, depending on the options chosen. This intensive course covers the entire syllabus for the TOGAF 9.1 Foundation and Certified Levels, preparing candidates for the TOGAF Part 1 and Part 2 examinations. The course is enhanced with a complete project case study that demonstrates how TOGAF is used in context. Numerous examples of architecture deliverables and artifacts are provided throughout the course, thus providing candidates not only with theoretical knowledge of TOGAF, but also its practical application and relevance. Candidates prepare for the Level 1 and Level 2 exams and have the option to undertake these exams. The competence and enthusiasm of the Instructor were key to a well delivered course…. I enjoyed the course enormously, the subject is fascinating and I was never bored and I do have a very low boredom threshold. Enjoyed John’s style and felt very engaged throughout. Excellent – subject matter expert but with a very engaging tutorial style. I thoroughly enjoyed the content – brought a high level of understanding to project management. John knew PRINCE2 literally inside out and in my opinion a very positive influence on all attendees offering support and serious knowledge of the subject matter with just the right amount of humour to keep you continually interested thorughout the 4 days of training – already recommended the course to fellow commuters. Brilliant!! John is able to bring extensive real world experience and blend this with detailed subject knowledge to achieve not only exam success for candidates but a better understanding of the subject also. At the end of a recent ITIL foundation session which John led, I noted to my company’s training team that: “I have no reservations about recommending the course. It was led by a highly experienced trainer who had a very effective teaching style. He delivered great content which I can apply immediately”. Also, even though I had limited prior exposure to ITIL I also did excellently well in the certification exam. John did a brilliant job encouraging the course participants to internalize the concepts of ITIL, ensuring that the best practices were not merely taken at face value, but were challenged and compared with other practices and models. John trained me in Prince 2 Foundation and Practitioner. I would highly recommend him as a trainer, he provides, humour and expert knowledge of both the theory and practical examples from his work experience. He is a class act. I was recently trained by John Green and if anyone were to seek my advice about taking a PRINCE2 Foundation and Practitioner course, I would have no problem recommending John to them. John is clearly very knowledgeable about Project Management, both in principle and in real-life practice, and has a very direct approach to his delivery. He is intuitive enough to balance the right amount of information to keep a group’s attention, which for me made his training sessions very easy to follow and also engaging at each point. I particularly admired his patience and his ability to communicate with all class members, regardless of their varying professional backgrounds and levels. His very high student pass rate speaks for itself and I am happy to be one of those successes. “I first met John when he was giving a Prince 2 course in Swindon. What struck me was his in-depth knowledge of Project Management. While satisfying all our needs to gain the qualification, which I did by the way, he was able to show us best practice in implementation. This was so very important as its really easy to make Prince fail as a methodology because you try and implement everything in the book. Later when I was requested to see if we could find anybody who was able to improve Project Management at one of our partners John was first on my list to call. John was recently involved in a major re-architecting of my company’s infrastructure. Downtime wasn’t an option and John came up with creative solutions allowing the project to go to plan/budget. His expertise and ‘can-do approach’ was instrumental to the positive end result. Please firstly register to access further TOGAF® content then please if you wish subscribe for more useful subject matter content.